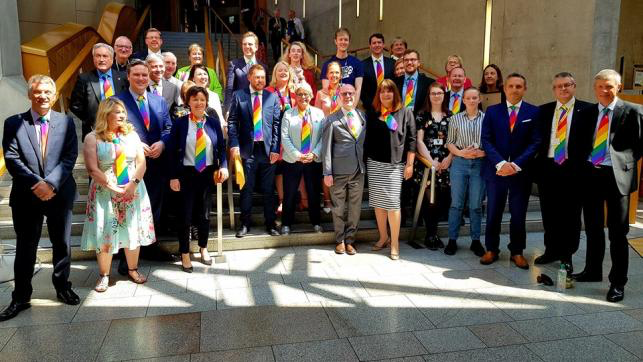 I liked this photo: it shows members of the Scots parliament wearing rainbow-coloured ties to mark their support for the TIE campaign. The TIE Campaign only three years old but is doing great things in Scottish schools. It aims to reduce bullying and ignorance by encouraging LGBT-inclusive education in schools, and it works. MORE than three quarters of Scots pupils who’ve attended LGBT inclusive assemblies in schools stopped using homophobic language as a direct result, new research has revealed. Nearly all pupils, 96 per cent, said the events in schools had made them more aware of the impact of homophobic, biphobic and transphobic bullying and attitudes on others, while 92 per cent said they’d since reflected on their own use of language. Furthermore, of those pupils who said they previously held negative views towards the LGBT community, 86 per cent said their attitudes had changed positively after attending the assemblies. One of my colleagues, a computing teacher, has found she has more female students signing up when traditionally it was more male. She thinks because we’ve tackled this as a whole that we’ve challenged stereotypes and broken down gender norms. So we’re finding it’s breaking through into choices now as well. …schools are still only emerging from the shadow of Section 28. The law, repealed in 2000, prevented teachers from discussing LGBT issues with children in schools. We can’t reverse the mistakes of the past, but we can ensure we don’t repeat them today.